Version 1.2.0 introduces a number of new features to ServicePlanner. On the Activity screen, each line of the Report Summary can now be clicked on to view more detail. For example, click on Placements to get a full breakdown of Placements per day for the month. You can click on each line item to jump to the Contact or the Visit details. 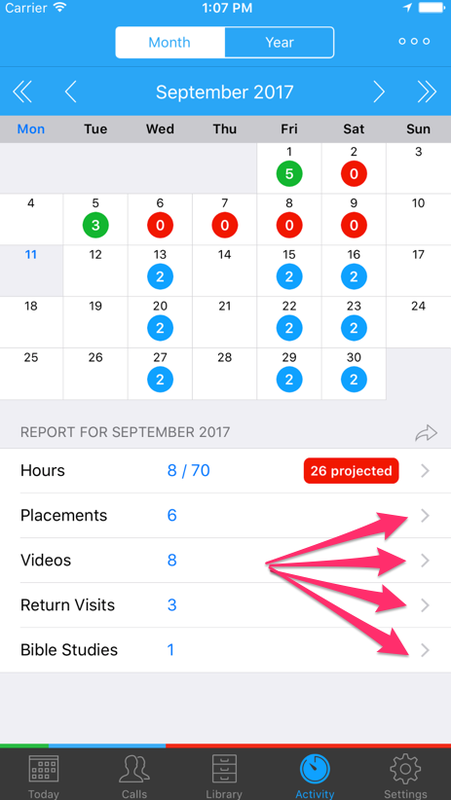 This provides a lot more visibility around your activity for the month and how the report metrics have been calculated. You can now tap on a Contact marker, and it will enter “move mode”. You will see crosshairs appear. You can now drag that marker to a new location. Simply tap elsewhere on the map to save the new location for that Contact. When Markers are manually added via the Map using the tap+hold gesture, they are no longer address based, but location based. For example in the past you would add a Marker, it would pass the latitude+longitude to Google to get the address for that location, and then the Marker would move to the official Google geocode for that address. But sometimes Google would get the coordinates wrong. Or sometimes you actually wanted the Marker where you put it, not where Google wants to move it to. This update will still get the details from Google, but based on the fact that you have manually placed the Marker, it will respect the location co-ordinates you chose. Maybe you have already added Contacts that don’t yet have markers on the map? You can easily add a location to that Contact – simply tap+hold on the map, and choose the new option “Move Existing Contact”. These enhancements are especially useful for countries where properties either don’t have addresses or the addresses in Google and Apple Maps are not so accurate. You can now save your favourite Filter settings to reuse them again. In the Filter window, scroll to the bottom of the “Current” tab and hit the “Save Current Filter Settings” button. Switch to the “Saved” tab to view existing saved Filters. Swipe to Edit or Delete a Saved Filter. Tap the top/left button on the Saved Tab to re-order the list of Filters. The Top filter is always the “Default” filter. When looking at your list of Contacts, or at the Map, you can always tap+hold on the Filter button (top/left) to quickly apply your Default Filter settings. You can view a screencast demonstrating the Custom Saved Filters here. Videos shown to a Contact can now be viewed inside the Contacts Library tab. 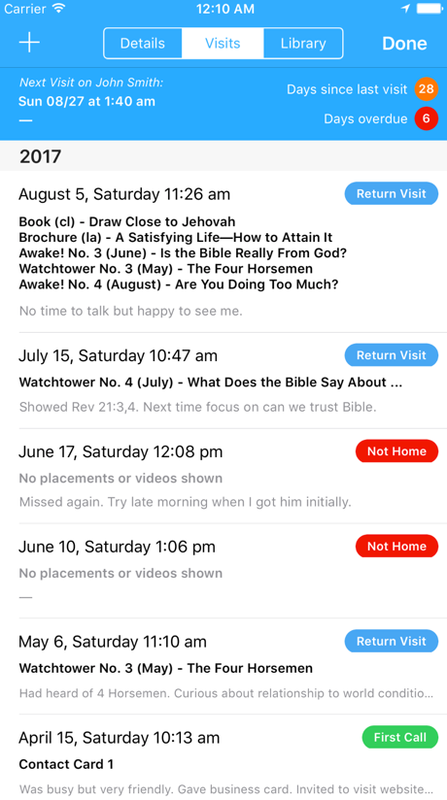 The Contact Library gives you a quick overview of all the Publications that you have placed with that Contact, or all the Videos they have been shown. You can now Filter on Videos. This is extremely powerful. For example use the Filters to list all Contacts that have not yet seen a specific Video. You can now enter a Note for each day in the Activity Daily Report screen. Displayed just under the Hours fields this provides an opportunity to explain what type of LDC or Consulting work you were doing, or enter any other details you would like to remember for that day. This feature was initially requested by users who want to log the multiple types of Credit Hours they do on a given day of the month – LDC, Remote Bethel Work, Congregation, Disaster Relief etc. A summary of these Notes for the month can also be viewed from the Hours detail screen. The reported time includes 8 LDC Hours. When viewing the list of Visits made to a Contact, the list will now itemise each Publication or Video from that Visit. eg. Before it might show “1 x Awake!” but now it will show “Awake! No. 3 (June) – Is the Bible Really From God?”. 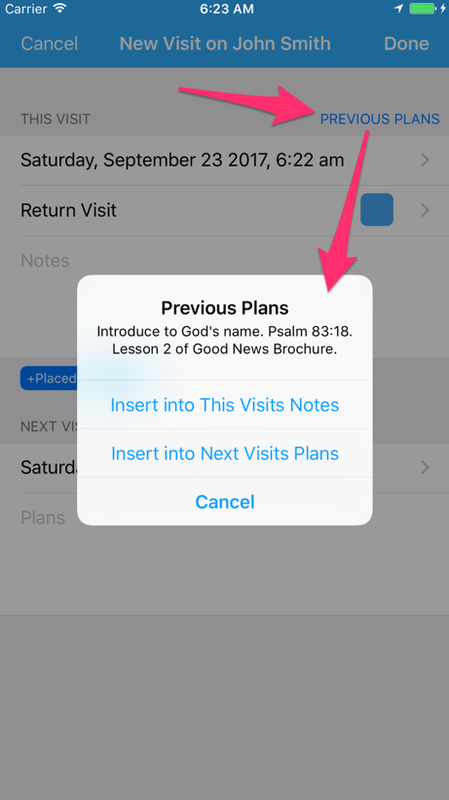 When adding your Next Visit, you can now insert your “Previous Plans” into the Notes for the current visit. 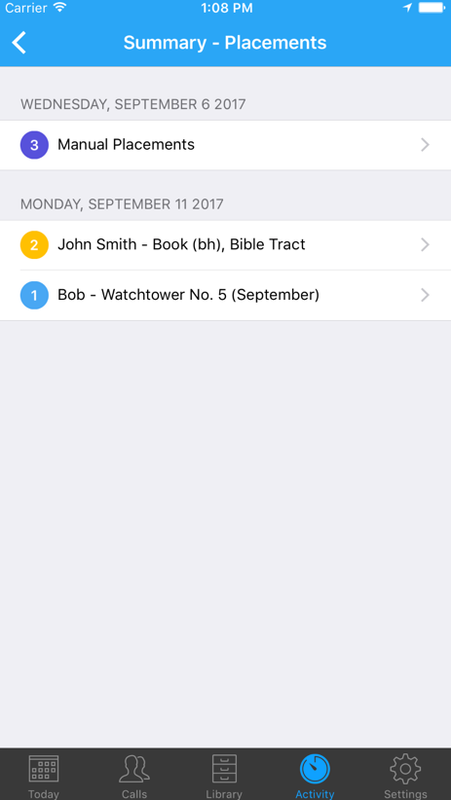 That can save you some typing – you shared the scripture and highlighted the points as planned, so lets use those previously typed notes. When adding a new Publication or Video, the search button will no longer populate the Cover Image. Users will now need to do this manually themselves using the “Add Cover” button. For an example of how to do this, watch the video in the Adding Videos to the Library article. In Settings > Reporting you can now choose to hide line items with a value of 0 in your final report. For example, if you did not have any Bible Studies instead of it showing “Bible Studies: 0” in your final report, it will hide that line item. For Publications in the “Other” category, you can choose if the Publication is counted as a Placement or not. This could be helpful for an item that you want to record as giving to the Contact, but should not be counted as a placement (eg Contact Cards). You can now send your report to multiple email addresses. In Settings > Reporting, enter multiple addresses separated by comma “,” or semi-colon “;”. The entire app has now been translated into Spanish and Italian! Thanks so much to our hardworking translators. Support for German was added in version 1.1. Work on other languages is underway. If you would like to help translate ServicePlanner into your language, please log your interest on the Issue Tracker. You can read more about the changes in version 1.2.0 on the Issue Tracker. I hope this update helps you to be increasingly more effective in your ministry and get the most out of using ServicePlanner.